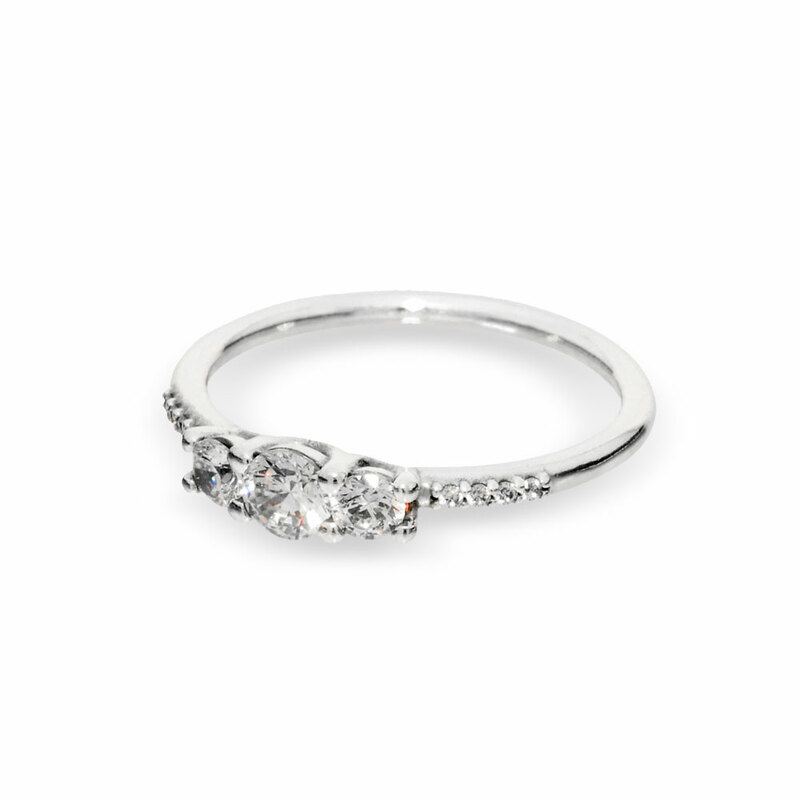 For everyday sparkle, this gorgeous ring is the perfect choice. Sterling silver and a crown of clear stones create a sophisticated fairytale look. Use it to start a new style chapter. Available online or in-store. Fairytale Sparkle Ring is rated 4.6 out of 5 by 69. Rated 4 out of 5 by mrsshannon2018 from Perfect for the Price My man and I recently decided to elope, and chose this ring as part of my first bridal set due to the price and size availability (I'm typically a size 4, which is almost impossible to find in most stores without having a resize). The small size of the ring looks great on my hand, and I loved the availability of bands to choose from as well... I just wish that this particular ring came in more than ONLY sterling silver! Rated 5 out of 5 by CynthiaG from Beautiful! I bought this ring to wear stacked with my wedding ring, which is the Pandora Inspiration Within ring. They go together perfectly and this ring adds just enough sparkle to my finger while still being dainty, which is exactly what I wanted. I love it! Rated 5 out of 5 by Roda from Very beautiful Bought this for myself as a you go girl you deserve it kind of thing. Totally worth it!! Love it. I wear it everyday. Rated 5 out of 5 by darling92 from Beautiful ring!! I bought this ring a few weeks ago and I fell in love with it coming right out of the box! I won’t take it off anymore! It’s simple but very beautiful! Rated 5 out of 5 by KianaDestiny from The diamonds just sparkle so beautifully I just received this as an engagement ring today and I absolutely love it. It’s so shining and the sparkles on this ring just shine. I love it so much.